An altogether enjoyable summer entertainment that manages, in its own way, to hearken back to those thrilling days of yesteryear. It certainly isn't perfect, but give The Lone Ranger a chance if you're in the mood for some old-fashioned western adventure fun. In spite of the length, it's still an enjoyable watch filled with more laughs than expected, or is probably appropriate for the genre. 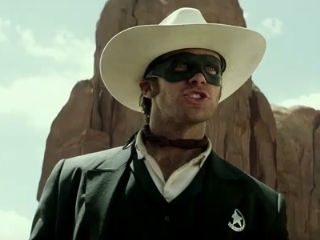 The Lone Ranger wasn't the best film I've seen this summer, but it is far from the worst. I would gladly recommend this, but be cautious of the overtly violent nature. Well, it sure was a strange and subversive Fourth of July gift Disney decided to give the country. The weirdest summer blockbuster to come down the pike in eons. I have no idea who this movie was made for, but I'm glad that I saw it. ...funny, exciting, heartfelt, and just full of real joy and great entertainment. a bloated but entertaining studio juggernaut. A sense of joy in Verbinski's action runs through and energizes the entire film, and it's an ingratiating quality that should not be so easily and quickly dismissed. It's certainly not your ol' man's "Lone Ranger," Kemo Sabe, but there's still plenty of kicks and stunts to make you wanna shout, "Hi-O, Silver! Away!" The first genuinely characterful action blockbuster of the summer: both a big, beautifully realised throwback to Hollywood Boy's Own storytelling and an intelligent revision of Old West history. Yes, this $250million reboot is overlong, over indulgent and tonally uneven, but it's also stuffed full of deadpan comedy, breakneck thrills and breathtaking visual spectacle. Everything about this film screams excess, from the ludicrous two-and-a-half hour running time to the whopping scale of the action sequences to Johnny Depp's bizarro costume. It's at times the most exciting live action film for years. It's no sort of masterpiece. But The Lone Ranger is a good deal less dreadful than advance word has suggested. Flying as high as an eagle or scampering across the tracks like a lizard, Verbinski's camerawork is off the-chain and the visual-effects are first class. Verbinski clearly knows how to stage action, with outstanding train-based set-pieces bracketing the film.